Fire Destroys Large Brick Home, ACE, February 14, 2011 - At approximately 3:10 am on February 14, 2011, a fire was reported from the subdivision of Taylor Lake Estates in Ace. The South Polk County Volunteer Fire Department was dispatched along with North Liberty County, and Livingston VFDs. Additionally, Deputy Troy Binford with the Polk County Sheriff's Office was dispatched to start an initial investigation. The large brick home with attached garage was located a 1000 East Taylor Lake Circle and was owned by Lilia Chancey, 78. Chancey was out of town when the fire broke out, however, her son, Jim Chancey was home. According to Jim, he was sleeping and woke up and felt his bedroom door and it was very hot. Chancey climbed out a window to get out of the burning home unharmed. The house was fully involved firemen arrived. The large house proved to be a challenge for the firemen and their pump trucks ran out of water. The house continued to burn until support from the Livingston Fire Department showed up to finish the job. 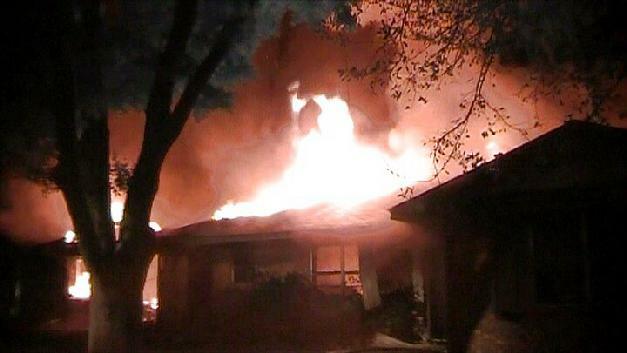 Nobody was injured in the fire and the home was insured. The fire was extinguished by 4:30 am. The fire will be investigated by Polk County Fire Marshal, Jay Barbee.